The recent crop (yeah, we just did that) of fairytale-adaptations just barely even try going beyond the formula, all the while pretending give us a new perspective on tales that fed our childhood. Jack The Giant Slayer, though, is honest. It is all about a boy and his adventure, saving the princess, a happy ending, and, most of all, GIANTS! Yeah, that's exactly what this movie's about - these ginormagantuan children of computer graphics who were relegated to folklore-ish heights during folklore-ish times for ill behaviour. However, it is a fairy tale, evil does not stay hidden for long, and we must have great danger. Why, you ask? To turn a formerly spirited and independent heroine (Eleanor Tomlinson) into, if not a snivelling wreck, then at least one noticeably devoid of the characteristics that make her remarkable. How else is a hero as lukewarm as Jack (Nicholas Hoult) supposed to save the day? Of course, there are the wonderfully ugly giants to slay, and beanstalks to climb and traitors to the throne to be stopped. And thus, we come to the utterly ridiculous "plot". Princess Isabelle is engaged to be married to the eeeevul Lord Roderick (Stanley Tucci), who has an ancient crown and some magic beans which would enable him to take over an ancient race of giants and, with their "help", the rest of the world. While Lord Roderick waited, for some unfathomable reason, to marry the princess, a monk steals the beans and gives these super-dangerous stairways to evil to Jack the farm boy in exchange for a horse, with a dire warning against getting them wet (looks like instant consumables aren't a 21st century thing - "Chaos in a pouch. Just add water."). Jack's uncle throws them away, and while Jack picks them up, one of them slips through the cracks in the wooden shack they lived in. Meanwhile, Princess, who is running away from marriage to a meanie twice her age, comes across Jack's shack, and takes shelter from a storm. Witty banter between cute royal and cute commoner ensues, until it is all ripped asunder by a beanstalk that grows out right through Jack's home. Princess goes up with the tree, and it's upto Jack to bring her back, and stop the giants from taking over the world. Wait a second. What happened to the eeeevul Lord Roderick? Who really cares? All you're gonna be thinking is, "Dear God, We're extremely sorry for having depleted the world's resources of face cream. Whatever it is that these giants did, it can't be worth living with skin like that. Sincerely, Cutting down on face cream consumption." And then there are the puns! One of the king's soldiers says to Jack when he suspects Jack of wanting to go up the beanstalk to impress the Princess - "You're barking up the wrong beanstalk." The. Wrong. Beanstalk. As you may have guessed, the biggest letdowns are the haywire plot and the dialogue that seems like it's written by college interns. On weed, no less. What props up the film is the graphics, of course, which aren't quite spectacular, but are still a treat to watch, especially the beanstalks. For a kiddy fantasy flick, the music barely makes its presence felt. The acting by all is uniformly good, which is not so much an asset as a waste of resources. 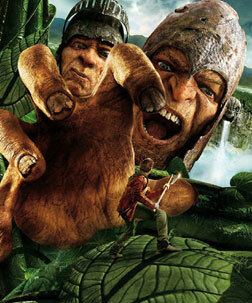 All in all, Jack The Giant Slayer is a pretty fun watch if you don't have anything else to do. Don't bother shelling out 3D fares, or, worse, IMAX fares for this one. Meanwhile, look "Jack And The Beanstalk" up on Wikipedia for the real tale. 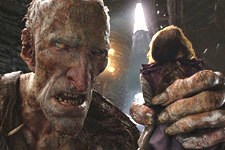 Be the first to comment on Jack The Giant Slayer (3D)! Just use the simple form below. fullhyd.com has 700,000+ monthly visits. Tell Hyderabad what you feel about Jack The Giant Slayer (3D)!